No one thought of pulling the hand break then huh? Wonder how it will go the second time round. The paper work to explain this is going to be a killer! wtf that guy has no skills what so ever!!! in fillming so instable hands is there any better quality on web ??? and yeah i knowwww i'm a troll because i can't see the danger he is exposed to!!! right???? but what about after the accident? just calm down and focus on your hand movements ! stupidity prevails triumphant once again! DOZENS of people there... nobody saw it coming! That really "IS" a MONSTER TRUCK!! I think this is in Argentina, not for the landscape, but for tthe insults: ¡Pelotudo! And because that's the way we do things here. #3 The handbrakes on trucks needs air pressure to be disabled. It's amazing how the truck kept the pressure during the crash. #13 I think the Italian flag painted on the side of the dump body puts this event in good old Italy. 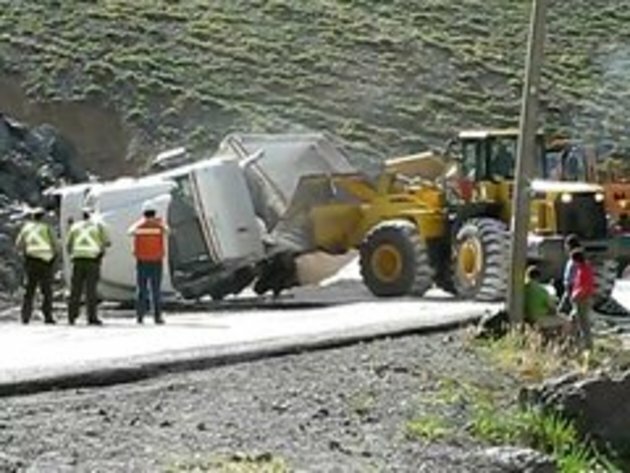 Wow.. A Truck that has two crashes and a Crash Video which show's neither..
That's definitely in South America as #13 pointed out in the accent, probably on the chilean argentine border given the terrain. #17 You sure don't have a clue about foreign languages. That's definitely not italian. And if I have submitted the video it doesn't necessary mean that I have filmed it. The vid was taken in Argentina. #20 Fair enough,but why is the Italian flag on the side of the truck? The green/white/red is very visible and I have never seen another country's flag just like that one. It must be a long way from home. #22 Nope , the Mexican flag has an eagle with a snake in its beak in the center bar. Only the Italian flag is just vertical bars of green/white and red. And the flag is quite possibly Italian, given a majority of Argentinians are of Italian descent.